This pet-friendly hotel is off Interstate 95, 16 km south of the Virginia border, in Roanoke Rapids, so the recreational opportunities to fish, boat, swim, water ski and wakeboard, are endless, between Lake Roanoke Rapids itself and Lake Gaston, just 8 km away. The Halifax State Historic Site, a 15 minute drive from the hotel, offers an audiovisual presentation, exhibits, guided tours and displays depicting the history of the town, as well as visits to different houses, a tap-room and a tavern from the 1700 and 1800s. The Cracker Barrel Old Country Store and Restaurant is within walking distance of the hotel, and there are dining, shopping and nightlife locations nearby. Guests may enjoy unwinding at the hotel's picnic area or in the heated indoor pool. As well as high-speed internet access, the hotel provides business areas and facilities, including secretarial services. 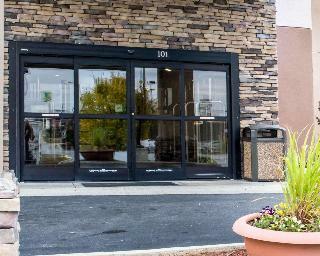 Located 16 km south of the Virginia border in Roanoke Rapids, North Carolina, off Interstate 95, this hotel is in an area full of attractions and recreational possibilities. On the edge of town is the Royal Palace Theatre, where visitors may catch an R & B, rock-and-roll or country and western concert. The Roanoke Rapids Canal Trail, on the National Register of Historic Places, starts at the Lake, taking users to the Museum and continuing to the Aqueduct and River Falls Park with a variety of wildlife, and a unique historical perspective into transportation on the Roanoke River. This hotel is ideal for both leisure and business visitors, with Wi-Fi, a business centre and meeting room, as well as a seasonal outdoor pool. 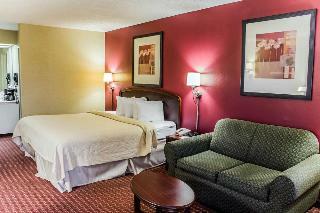 Guest rooms are equipped with pillow-top mattresses, refrigerators, coffee makers, cable TV, microwaves. Sofa sleepers and connecting rooms can be requested.